Today is Earth Day and I give thanks to Mother Nature for her endless gifts. As we turn our focus on cleaning up and protecting the environment, events in Washington, DC (cleaning up the Anacostia River) and communities around the globe are being held today to remind us that our natural resources are precious and finite and shouldn’t be taken for granted. When we take better care of Mother Earth, she takes better care of us, giving us tranquil beauty and continual inspiration. Nature also has the incredible capability to heal us: the fragrance of a flower, the cleansing sound of the ocean and the glorious rise and set of the sun. When I spend time outdoors, I de-stress and relax and start to feel connected and much better almost immediately. Whether its a leisurely stroll or an aerobic run, I take deep breaths and notice and try to enjoy whatever is around me. Right now that would be the smell of freshly cut grass and deep pink azelea buds ready to burst open. 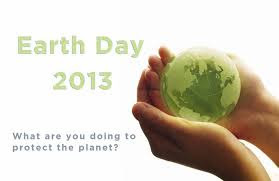 The first April 22 Earth Day was held in 1970. I don’t think it’s a coincidence that the multi-talented and award-winning singer songwriter Joni Mitchell wrote and originally recorded “Big Yellow Taxi” also in 1970. It’s a great song that is known for its environmental concerns.